On 15 March 2018 in Aden City, Yemen, children are displaced from the city of Taiz because of the conflict. More than 10,000 children were killed or maimed in conflict last year while more than 8,000 youngsters were recruited or used as combatants, the United Nations reported on Wednesday. UN chief António Guterres has expressed outrage over the numbers, according to a statement issued by his spokesperson. 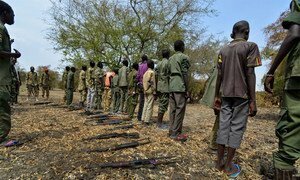 Virginia Gamba, the UN’s expert on Children and Armed Conflict, said 66 parties to conflict are listed this year - three more than in the 2016 report - with nine government forces and 57 armed groups named. More than 15,500 children became victims of widespread violations – including shocking levels of killing and maiming, recruitment and use, and denial of humanitarian access – a new United Nations report has revealed.